In the early days of the Space Shuttle Program, which employed reusable rocket engines, NASA looked for fasteners that could endure repeated, intense vibrations without jarring loose. A researcher at Goddard Space Flight Center came across Holmes Tool Company’s patented Spiralock threading. He tested the invention meticulously and found it exceeded the Agency’s demand. 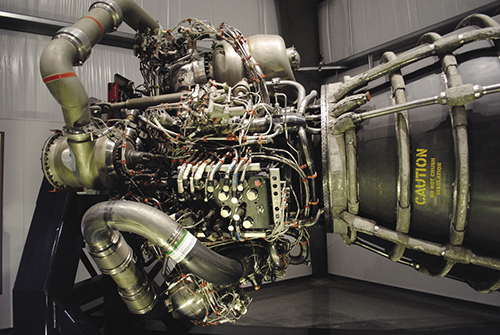 Spiralock came to be used on more than 750 tube clamps, joints, and brackets in Space Shuttle main engines and, after the test results were published in 1984, a wide array of industry applications, from diesel engines to pacemakers. NASA scientists routinely pioneer advances in cutting-edge fields like lasers and computer chips, but sometimes it’s the innovations they make in simple technologies that help optimize the machines of tomorrow. More than 30 years after a researcher at NASA’s Goddard Space Flight Center tested and demonstrated the significantly improved fastening ability of an altered screw-threading, the design continues to catch many engineers by surprise. Discovering the technology, says Cobra Puma Golf, has helped the company achieve the lowest-ever center of gravity in a golf club. Screw threading dates back to antiquity, when grape and olive presses used an inclined plane wrapped around a shaft to convert minimal human effort into tremendous crushing force. Advances to this simple concept have been few and far between, with the screw finally beginning to be used as a fastener around 500 years ago. An enduring problem, however, is that vibration can eventually jar screws and bolts loose. And few fasteners experience more intense vibration than those in a rocket engine. In the early days of the Space Shuttle Program, which used the first reusable rocket engines, NASA took an especially keen interest in fasteners that could endure the vibrations of repeated liftoffs, as well as extreme temperature variations that cause metals to expand and contract. That was when the Agency came across an invention by Horace Holmes of Holmes Tool Company known as Spiralock threading, a slight alteration to traditional threading that promised considerably stronger joints. The innovation behind Spiralock threading, on the right, is a 30-degree wedge ramp in the trough of the female thread. This forces the thread on the bolt against the ramp in the nut, distributing pressure along the length of the thread, whereas standard threading, shown on the left, puts about 80 percent of the clamp load on the first two threads, with most of the threading making little contact. Threading in female nuts and bolt holes had always precisely mirrored that of the male bolts that screwed into them, allowing them to perfectly follow each other’s contours. The result, however, was that there was little if any pressure for most of the length of the connection, with about 80 percent of the clamp load being carried by the first two threads. Holmes’ idea was to blunt the trough of the female thread with a 30-degree wedge ramp. 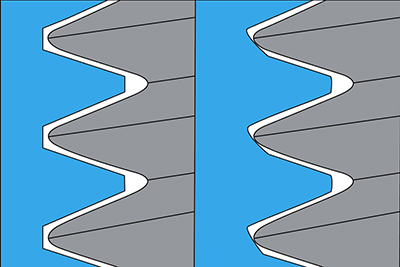 The result was that most of the length of a bolt’s threading ridge would be forced against the wedge in the nut, causing a more even distribution of the load along the length of the connection, with the first two threads now carrying just 25 percent of the load. Holmes’ creation was patented in 1979, but while the design came to be used in a handful of car engines in the early 1980s, it wasn’t until the 1984 publication of a lengthy study by Goddard researcher James Kerley that Spiralock began to be used more widely. Kerley found that Spiralock nuts could withstand double the vibrations that would loosen a standard nut, and for 10 times as long. They didn’t lose clamping power after a bolt and nut combination was torqued on and off 50 times, far exceeding NASA’s demand for a fastener that could be reused at least 15 times. Shortly after Kerley’s study was published, Spiralock was applied to more than 750 tube clamps, joints, and brackets in a set of Space Shuttle main engines, where it easily withstood further testing (Spinoff 1987, 1995). 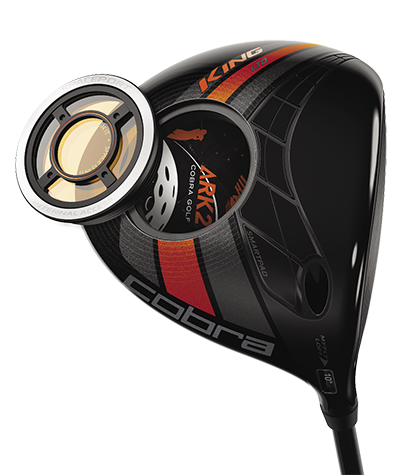 Cobra Puma Golf wanted a “spaceport door” to screw into the bottom of its KING LTD Driver in celebration of the testing the company was doing on the ISS. The vibration of repeated drives, however, would cause the little portal to come unscrewed. The company researched NASA’s techniques for dealing with intense, repeated vibration and came upon Spiralock threading, which now holds the doors firmly in place. The access to the inside of the club head also allows the clubs to be more precisely weighted, with a lower center of gravity. The similarities between spacecraft design and golf club engineering may not be obvious, but they’re there, insists Mike Yagley, director of innovation, research, and testing at Cobra Puma Golf, based in Carlsbad, California. Engineers in both fields have to consider various alloys, worry about weight, strength, and durability, and otherwise bring together a wide variety of factors to create one optimized design, he says. Before long, the company was consulting with employees of various NASA field centers, and by September 2014 CASIS had secured Cobra Puma Golf a slot as a customer for a research payload to the ISS. The company sent up 20 tiny “spaceport doors,” modeled after the ISS cupola, for a one-month experiment testing the hypothesis that silver would deposit more uniformly and with larger crystalline growth in zero gravity, resulting in higher durability. The door was to be a unique feature of Cobra Puma Golf’s KING LTD Driver, but an unforeseen problem had arisen. “The spaceport door turned out to be in an extremely high-vibration, high-load environment,” Yagley says. After hitting golf balls over and over, the portal, which screws into the bottom of the club’s head, began to come unscrewed, much like a bolt in a rocket engine after repeated use. Having come to respect NASA’s problem-solving approach, Yagley researched the Agency’s use of fasteners in high-vibration environments and came upon Spiralock threading. “We incorporated that thread around our spaceport door to help alleviate the effects of vibration occurring during impact,” he says. To cut the thread into the clubs, the company acquired a licensed cutter and gauge from Spiralock, now part of Stanley Engineered Fastening. Yagley says the spaceports now hold fast, and the company started selling the drivers in November 2015. “The door gives access to the inside of the golf club, which no one has had or seen before,” Yagley says. The “spaceport door” enabled by Spiralock threading in Cobra Puma Golf’s KING LTD Driver allows it to be what the company believes is the first club with a zero center of gravity, meaning the center of gravity for the whole club runs through the center of the driver’s face. 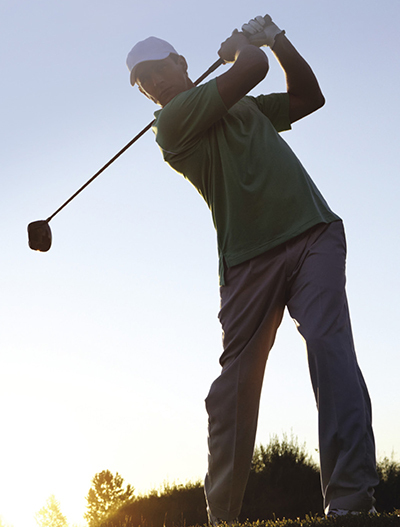 It’s a feat golf club makers have been attempting for centuries. Normally a finished driver head is just under its target weight—typically around 200 grams—because it’s easier to add weight than to subtract it, he explains. Then, just enough hot melt—a sticky substance which doubles as weighting material and debris catcher—is injected through a small hole in the sole of the club. However, “we would prefer not to have to put the hot melt in,” says Yagley, noting that it’s hard to control where the mass goes inside the club, and it can also affect acoustic properties. Instead, with the spaceport door in the KING LTD Driver, a tungsten weight can be inserted. The metal can be filed to the precise weight necessary for each club before it’s locked in place. The aluminum door itself, which features a polycarbonate window into the club’s interior, also serves as a 16-gram weight. He adds that the door to the club’s interior also allows the company to make custom clubs, adjusting the size and position of the tungsten weight to suit individual golfers’ styles. “This is the best golf club we’ve ever made, and we think it’s just the beginning,” he says. As for the ISS experiment, Yagley says the results are part of ongoing research that should pay off in the future, especially as the company continues to partner with NASA, sharing knowledge about construction materials, processing, and testing.